When you’re choosing a mango from the grocery store, we all typically gravitate to the brightly colored ones with vibrant red and orange peels. But did you know that color is not the best indicator for ripeness? In fact, the red blush on some mangos is usually just a result of sun exposure to the fruit while it was on the tree. If you’re going off color alone, you may get a mango dud. 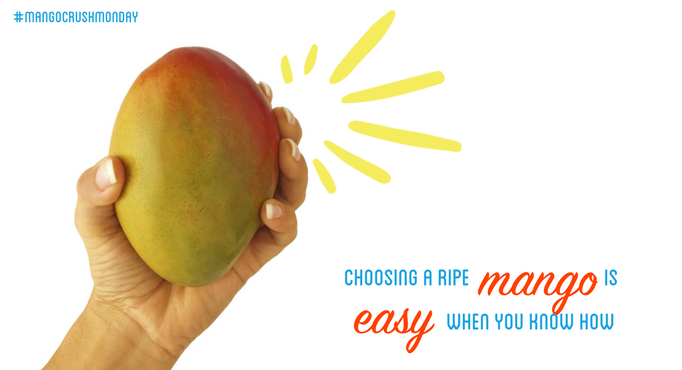 But mangos are super easy to choose once you know how to do it! All you have to do is pick up a mango and give it a squeeze. Did the mango give a little? Then it’s ripe and ready to eat! If the mango is harder, you should give it a few more days to ripen or choose a different one. You can always choose less ripe mangos, put them in a paper bag when you get home and wait for them to achieve ultimate ripeness.